If baptism is the first thing it talks about in the gospel, and the last thing it talks about in the gospel is, "Go ye therefore, teach all nations, baptize," then baptism must be important. Did you know that when a human baby is born about 78% of it's body is made up of water? Our water ratio drops somewhat as we age but water remains an essential part of our survival. In fact, a mere 2% drop in body water can cause fuzzy short term memory, difficulty with basic math, and trouble focusing on a computer or printed page. If the water in your body drops 5% you'll no longer be able to see. A 10% drop takes away your ability to hear. Water plays a crucial role in almost every body function. But some researchers estimate that 75% of Americans are chronically dehydrated. Insufficient water increases the risk for obesity, fatigue, and a host of common diseases. Water is essential not only to our physical bodies but our spiritual survival as well. As the living water, Jesus is the ultimate thirst quencher for our souls. And we receive Him in a special way when we enter the waters of baptism. So join me now, friends, for today's program as we take a closer look at this very important subject. How we can be born of the Spirit and the water. The purpose of prophecy is that you might have a personal encounter with God. If we're only studying Bible prophecy so that we can, you know, have our curiosity about the future satisfied, it won't do you any good. You know, the Bible says the devils believe and tremble. You need to have a personal encounter with Jesus - a relationship with Him. And that is the reason why we're having this special study tonight called “A Prophet in the River”. Now, when you talk about the river, we're thinking principally about the Jordan River. And, if you look in the Bible at the different experiences in the Jordan, they all tell us something about the plan of salvation - and it does tie into prophecy, as you'll see. There's a number of miracles that happened in the Jordan River, in the Bible. For example, before the Children of Israel entered the Promised Land, when they were still coming out of the wilderness, the border, really, between the wilderness and the Promised Land, was the Jordan. And God wanted to test their faith. And He said, 'You've got to get across that river - but it was flooding in the spring - He said, 'Here's what I want you to do: the priests are to put the ark on their shoulders' - they carried it on these poles - 'and I want them to march off into the river. Now, when they left Egypt, God parted the sea before they started walking. But, before they got to the Promised Land, He wanted to see, 'Have you learned to trust Me? I want you to start walking before I part.' so the priests, obediently - and they're carrying this virtual golden anchor - they were going to sink if there wasn't a miracle. They started walking off into the river and when their feet touched the water, the waters, at that point, flowed down. The waters ahead began to wall up and just created a great big dam - an invisible dam - and the ground dried before them. He parted it so they could cross over. Now the Jordan, in the Bible, represents death. You know the Jordan River is the lowest river in the world? Where the Jordan River runs into the Dead Sea is the lowest point on earth. It's over 1300 feet below sea level. It's a symbol of death and it's also connected with baptism and salvation. So here, before they got into the Promised Land, God works this miracle. The whole nation passed by the priests who were holding the Word of God. It's like their lives were passing in review, as they went from the wilderness into the Promised Land. Then the next interesting miracle is regarding an Assyrian general - wasn't even an Israelite - by the name of Naaman - good man, mighty man, but He came down with a deadly case of leprosy and Elisha the prophet said, 'Go wash in the Jordan River seven times and your flesh will be restored to you again. And so, he dipped in the river, finally - he was stubborn at first - covered with leprosy - maybe even missing fingers and toes - washed in the Jordan seven times, and finally, he came up the seventh time and he was clean. Amen. Now that ought to make you think - because leprosy in the Bible is a type of sin. Someone came to Jesus, once, covered with leprosy. They said, 'Lord, if you will, you can make me clean.' He reached out and He touched them and He said, 'I will. Be clean.' and their leprosy was gone. That quick. How quickly can God wash away our sin? When we come in faith right away and say, 'Lord, if You will.' is He willing? Yes. 'You can make me clean.' Believe. He says, 'Be clean.' That's what He said to the leper - and he was clean. How did the world come into existence? God said, 'Let there be light. Let there be land. Let there be an atmosphere.' And it happened. Now, that leads us a good segue into our first question about tonight's study. What New Testament prophet washed people in the Jordan River? And it says, "In those days came John the Baptist, preaching in the wilderness of Judea. And there went out to him all of Judea, and Jerusalem, and were baptized by him in the river Jordan, confessing their sins." Now, it talks about John the Baptist there in Matthew chapter 3, but if you read the story in the gospel of Mark, do you realize that the gospel of Mark and the gospel of John begin with John the Baptist? John the apostle is different from John the Baptist. The gospel of Mark, gospel of John, start with someone baptizing. Why did they begin their gospels there? How does the Old Testament end? The Old Testament says, 'Behold I send you Elijah the prophet before the great and dreadful day of the Lord.' and Jesus said, if you can receive it, that John the Baptist was Elijah who was to come. He came in the spirit and the power of Elijah. The angel Gabriel told John the Baptist's father, 'This child is going to come in the spirit and the power of Elijah.' It was prophesied that He was going to come. And Revelation tells us there's going to be another wave of the spirit and power of Elijah in the last days. So this does relate to prophecy, but we're going to talk a lot about baptism tonight. We're going to talk about what John talked about. If it's important to Jesus, it should be important to you. What glorious Bible ceremony symbolizes the washing away of the leprosy of sin? You can read in Acts chapter 22 - and this is relating to the conversion of the apostle Paul - He said, "Arise, and be baptized, and wash away your sins, calling on the name of the Lord." Now, is it clear to everybody Jesus came to save us from our sin? Amen. Has God created a ceremony - an institution - by which we submit our lives to Him and our sins are washed away? It's a ceremony that represents that. What's it called? Baptism. Baptism is as important to a Christian as a wedding is to a marriage. Did you get that? And this is not Pastor Doug's teaching, this is what the Bible teaches. Call on the Lord, being baptized, washing away your sin. They're all connected there. Third question: according to the Bible, how many different kinds of baptism are acceptable? Well, you read there in Ephesians chapter 4, verse 5, it's pretty clear. It says, 'There's one Lord, one faith, one baptism.' I believe there's one faith we are baptized into. I believe there's one Lord that we serve - Hear o Israel, the Lord our God is one.' Are there a lot of counterfeits? Yes. You know, the devil is a master of counterfeits. The devil has a counterfeit for virtually every truth of God. Have you learned that? And there's also a counterfeit for baptism. And, in the counterfeits, the devil is trying to rob the power of the teaching. What - where did all these other counterfeit forms of baptism originate? Where'd they all come from? Some are from different traditions - you can read about this in Mark chapter 7, verse 8. It says, "For laying aside the commandment of God, ye hold the tradition of men." Christ said, 'They often lay aside the commandment' - we've learned that about the Sabbath and other things, where people lay aside the commandments of God to follow popular traditions. And then, you know, if you go back and you look around the Middle East, it is really clear from history and even archaeology, that the only method of biblical baptism, in the beginning, was immersion. Here's a picture of a first century baptistery in Philippi and it's really clear, it had steps going into it, it was in the church. Here's one from - it's in the Negev Desert, built during the Byzantine time. It's a Baptistery in the shape of a cross, again, with steps going into it. And they used to have to fill them by hand so they didn't make them too big. That was between 300 and 500 A.D. Here's a fifth century baptistery in Emmaus and you - maybe you can read about that in Luke 24 - the road to Emmaus - the town actually means 'hot water' so they had springs near there. Christians were baptized. It didn't - at first it was pouring and then it was sprinkling and it gradually changed through compromise and - you know, you can rationalize anything if you want to. Matter of fact, you can read in history, it was not until the Council of Ravenna - 1311 - over a thousand three hundred years after Christ - it wasn't until the Council of Ravenna that sprinkling and pouring were officially accepted as equally valid as immersion in the rite of baptism, and so, you could do both. Eventually they gave up immersion for the more convenient sprinkling. And it just - it's one more of the many examples where the church has drifted away from the teachings of Jesus. And what do we want to happen before Christ comes? We want to come back to the Bible, right? Come back to the teachings of Christ. One Lord, one faith, one baptism. So, what is baptism? What does it mean? Right in the word, it tells you something about the true form of baptism, what it means, and why it's important. It comes from the Greek word 'baptizo' and baptizo means 'to immerse; to plunge; to dip' - it's talking about a cleansing - under water. You can read in Colossians chapter 2, verse 12, "buried with Him in baptism, wherein also ye are risen with Him through the faith of the operation of God, who hath raised Him from the dead." So, it's a symbol of a death, a burial, and a resurrection. How was Jesus, who is our example - how was He baptized? Now, a Christian's a follower of Christ. You might want to ask the question: why was Jesus baptized? Was it for His sin? No. No, He was baptized as an example for us. I'll say more about that in a minute. How was He baptized? This was the seventh miracle in the Jordan. "Jesus came...and was baptized of John in the Jordan River." And the Bible tells us that they needed a river. Now, there's a lot of different methods of baptizing today. Sometimes they sprinkle a little water, they pour - some people say baptism's only spiritual and they speak words and they even have some pastors you can call over the phone - they say they baptize you over the phone with words. That's the dry-cleaning method, evidently. And so they've got all these different - some sprinkle salt and a lot of churches - there's a lot of counterfeit baptisms out there, but the Bible's pretty clear about what happened. It says He was baptized by John in Jordan "and straightway coming up out of the water. He saw the heavens opened." - that's a miracle - and the Holy Spirit descending. All of the miracles about the Jordan River in the Old Testament tell us about salvation because it's connected with salvation - the New Testament, in Matthew and Luke, begin with the birth of Jesus. Mark and John begin with baptism and the ministry of John the Baptist and it's a start - when does Christ's ministry begin? With his baptism. He lived thirty-three and a half years, but He was anointed with the Holy Spirit at His baptism. The method was immersion. That means He went down under the water - it symbolized a washing, a death - because you hold your breath - and then walking in a newness of life. And it says also - you read in John chapter 3, verse 23, "Now John also was baptizing in Aenon near Salim, because there was much water there." So, if the biblical method of baptizing is to sprinkle a little water, then why would you need a river? You could baptize with a canteen. You could do it in the city. You could do it by a well. But it says they needed a river - they needed a river with much water. In other words, deep enough where people could be immersed. And all the people came down to the river to be baptized. Now some have asked me, 'Well, Pastor Doug, does it have to be fresh water?' I think you could probably point to some cases in the Bible where people were baptized in the ocean. The idea of the symbol is to be immersed, consecrate your life to the Lord, say 'This is it. I want to make a public declaration of my surrender to Jesus.' And you come up to walk in a newness of life. "Therefore we are buried with him by baptism into death:" - same principle we saw earlier in Colossians - "that as Christ was raised from the dead by the glory of the Father, even so we also should walk in a newness of life." Baptism represents a turning point. Let me see if I could illustrate it this way: ladies out there, how would you think about a guy who proposed to you and He said, 'I love you. Would you marry me? I think if we could just get married, I'll stop dating the other girls.' (Laughter) as though the wedding ceremony is going to suddenly make everything okay. Now baptism is a ceremony, but it's a ceremony that represents you have made a commitment that you love Jesus, that you're repenting of your sins - you see He's died for your sin and you want to follow Him. Amen? Amen. And so, you see, the changes should happen before baptism, but it doesn't mean everything changes. In other words, there's still growth that happens after baptism. How many of you that are married learned some things that you didn't know about your spouse before you got married? How many of you knew everything about them before you got married? I saw one hand. You didn't hear the question. (Raucous laughter) You're just being supportive. (Laughter) I think everybody learned something new afterward, am I right? And so, we commit our lives to Jesus - you're still going to grow in Christ. You're going to learn - you'll make mistakes, but you want to have your life committed. You want to turn away from the sins that are dragging you down. You don't want to be a captive. Will there be people in Heaven that were not baptized? Yes. Sure. The thief on the cross who died by Jesus when Christ was crucified, he didn't have time to get baptized. Sometimes I go to hospitals and I visit with people and talk to them about the Lord in the closing hours of their life and they're all hooked up to hospital machines. They accept Jesus - can they be saved or do I have to try and find a way to go immerse them? Of course God'll save them. I've been in prisons where they will not allow a baptism for a person on death row. Will baptism be an obstacle to their salvation if they totally surrender to Christ? No. You know why? Because Christ got baptized, not for His sin, but I think that, in the same way Jesus died for our sin, for those that can't be baptized, they get credit for His baptism. Amen. But if you can be, you should be. Amen. Why wouldn't you want to? And, again, Christ said to Nicodemus in John 3, verse 5, "Except a man is born of water and of the Spirit, He cannot enter into the Kingdom of God." Doesn't that sound like a priority to you? And what's important to Jesus ought to be important to us. Now, you need both births if you're going to be saved. Unless you're born of the water and born of the Spirit - and there are some churches that only emphasize water baptism - but Christ said you need Spirit baptism. They come together. Peter said, 'Repent, every one of you, and be baptized in the name of the Lord Jesus and you shall receive the gift of the Holy Spirit. 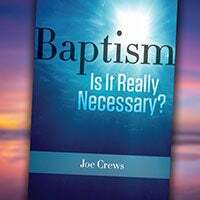 Now, it may come at different times, but doesn't the baptism of the Holy Spirit replace baptism by immersion? No, they weren't meant to replace - they go together. And Peter said to them, and I think I quoted this to you earlier in Acts chapter 2, verse 38, "Repent and be baptized every one of you in the name of Jesus Christ for the remission of sins, and ye shall receive the gift of the Holy Ghost." Peter puts them together, doesn't he? Be baptized and - for the remission of sin - you'll be filled with the Holy Spirit. So, you needed both. You needed the baptism of God and the baptism of your choice and your surrender. And so, both baptisms are still very important, according to the Bible. According to Scripture, what must a person do before he or she is baptized? There's some biblical criteria. Well, for one thing, you need to understand the teachings of Jesus. Now, as I mentioned, it doesn't mean you understand everything. Jesus said, 'Go, therefore, teach all nations, baptizing.' Before baptism, there should be some foundational teaching where a person understands the basics and most churches have, you know, some - even the Catholics have a catechism - there's a teaching class. There's - some have a baptismal class where you go through the foundational teachings - you should understand the place of the Bible, the Godhead, the coming of the Lord, what the Christian life means - and be willing to say, yes to those things. You may not understand everything and there's more teaching that comes later, but you're saying 'yes' to the principle teachings of the gospel. Secondarily, you need to not only understand them, you need to believe them. Now that's really important. Believe means, of course, you accept with your heart, but 'believe' means 'be live'. A lot of people misunderstand the word 'believe'. The Bible says that devils believe. The devils know that Jesus is real and the devils know that He died for your sin. The devil even knows He loves you. It won't save him. The devil knows God is love. It's not going to save him, it's just a cerebral knowledge - it's a fact. Believe means to 'be live'. God so loved the world He gave His only begotten Son that whoever 'be lives' in Him will not perish but have everlasting life. That means 'a willingness to, not only say, 'I think it's true,' but a willingness to follow. So, if people say, 'Lord, Lord, I believe you're the Lord.' and they don't do His will, they're not believing in Him. When Jesus says, 'Come to Me.' and you say, 'I'm coming, Lord.' but you don't - Christ told the parable about that. He said, 'Which of them did the will of his father?' And so, He wants us to follow. So believe in His teachings. You remember the story where Philip baptized the Ethiopian treasurer and He said, 'Here's water, can I get baptized?' You know what Philip said? 'If you believe with all your heart, you may.' And then you've got the story of this Philippian jailer. There's an earthquake. Paul and Silas are in prison. This earthquake opens all the prison doors and the jailer, he's ready to kill himself and Paul says, 'Don't hurt yourself. We're all here.' - and he's the one who's just whipped Paul and Silas and put them in the stocks. They forgive him and he's so moved by the power of the angel that opened the doors, He takes them into his house, He washes their wounds, they preach to him - He said, 'What must I do to be saved?' They said, 'Believe in the Lord Jesus Christ.' Amen. Now what do you think they meant by that? Believe the teachings of Jesus. Be willing to follow Christ. That's what it means. There's a lot of cheap preaching about what it means to believe these days. Believing means - John the Baptist said to repent - if you believe and you repent - whoever confesses and forsakes his sin will have mercy. It means being willing to turn. Repentance is a u-turn on the road of life. That means 'you turn' - you change directions. Agree to turn from a life of sin. Of course, I just referenced that. Romans 6, verses 5 and 6 - Luke 3, verse 7 - John the Baptist - you know the first thing John said when He started preaching? First word, 'Repent.' What was the first word out of Jesus' mouth when He started preaching? 'Repent.' It says, 'At that time, Christ began to preach saying, 'Repent, for the kingdom of Heaven is at hand.' How often do we hear good messages on repentance? That means you look at the cross, you see Jesus is there for your sins and it hurts you and you're sorry. So many messages today are just all feel good. It's all positive thinking. But, you know, before you can really feel good you've got to feel bad. The Bible says, 'Humble yourself in the sight of God and He will lift you up.' But, before He lifts you up, you've got to admit your sin. Amen. Confess your sin. Turn from your sin. God can't save you from your sin until you acknowledge your sin. And, if you say, 'Lord, I can't change. You've got to help me - I'm helpless.' that's when you really begin to get a new beginning - is when you realize your helplessness. Martin Luther used to say, 'God creates from nothing, so until you become nothing, He can do nothing with you.' Amen. Until you realize how helpless you are and you fall, broken, like Peter and you weep - Peter went out and wept bitterly after He denied Christ. That's when he was a broken man and that's when he was Spirit filled. You come to the place where you realize how weak you are, that you can't change without God's help. So that's what it means. Be willing to repent. Don't get baptized if you're not sorry for your sin. Repent of past sins - and that would involve confession. How many remember every sin they've committed? That's right - do you have to repent of all of them by name? We're in trouble. But you could start with categories. God even gives you an outline in the Bible. You can call on the Ten Commandments and just look at them and go through the Ten Commandments and say, 'Lord, I'm sorry for my sins. I have broken these commandments. And say - pray that prayer of David, 'Lord, search me. Try me. See if there's any wicked way in me and lead me in the way everlasting.' Ask Him to reveal to you where you may need to make a change, and accept Christ as your personal savior. He's not just the Savior of the world, He is saving you from your sins. Announcer: Don't forget to request today's free offer. It's sure to be a blessing. And thank you for your continued support as we take the gospel of Jesus Christ to the world. We hope you'll join us next week as we delve deep into the word of God to explore more amazing facts.